TCU Football limited the Big 12’s top offense to just below 250 yards, but the inability to create consistent offensive firepower gave Texas Tech the edge, 17-14. Despite leaving the Iowa State game two weeks ago with a shoulder injury, Patterson decided to start sophomore quarterback Shawn Robinson. Shawn Robinson threw for two touchdowns and one interception two weeks removed from his shoulder injury. Photo by Cristian ArguetaSoto. Robinson passed for 290 yards and two touchdowns while also rushing for 51 yards on seven attempts. 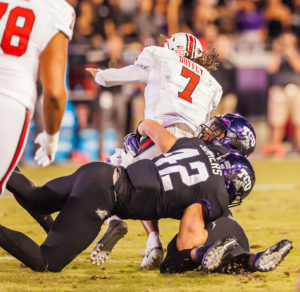 Texas Tech chose quarterback Jett Duffey to run the show and his versatility proved difficult for the Horned Frogs’ defense to match early in the contest. Duffey ran for 23 yards, broke multiple TCU tackles and accounted for 28 yards through the air on their first drive. TCU’s defense held the Red Raiders to well below their season yardage average. TCU vs TTU. Photo by Cristian ArguetaSoto. Duffey finished the game with 89 yards rushing for one touchdown and passed for 190 yards and a touchdown through the air. He played every drive but the first of the second half. The Red Raiders broke the scoreless tie as Clayton Hatfield connected on a 22-yard field goal midway through the first quarter. The Horned Frogs appeared to have an answer for Texas Tech on their next drive. Despite fumbling the ball twice, quarterback Shawn Robinson led the Horned Frogs down to the Red Raiders’ eight-yard line. Wide receiver Jalen Reagor could not control Robinson’s pass, bobbling it and dropping it for a loss of eight yards. TCU’s second fumble came on a designed Robinson run. He lost the football after his 16-yard rush, but it was recovered by wide receiver Derius Davis and returned to Texas Tech’s eight-yard line. The drive culminated in an interception thrown by Robinson. Jalen Reagor celebrates his touchdown. TCU vs TTU. Photo by Cristian ArguetaSoto. After holding Texas Tech to the one yard following the interception, the Horned Frogs quickly recorded their first points of the night. Their 42-yard drive was capped off by a 20-yard strike from Robinson to a wide-open Reagor. The Frogs had an opportunity to extend their lead to seven points in the final seconds of the half following an interception by cornerback Julius Lewis, but placekicker Jonathan Song barely missed his 47-yard field goal attempt wide left. TCU’s defense was able to hold the Red Raiders and their Air-Raid offense to three points in the first half. The Big 12’s top-ranked offense recorded only 124 yards and 3.8 yards per play. Texas Tech has averaged just under 600 yards per game this season. The Frogs earned 214 yards in the first half, with 155 coming from Robinson: 124 in the air and 31 on the ground. Overall, the Horned Frog defense allowed 353 total yards. Julius Lewis celebrates his interception. TCU vs TTU. Photo by Cristian ArguetaSoto. Texas Tech regained the lead on a 62-yard pass from Duffey to wide-open wide receiver Ja’Deion High, giving them a 10-7 lead. Following a third quarter in which the Horned Frogs only accounted for 57 total yards and two first downs, Robinson found wide receiver KaVontae Turpin in the end zone for a 31-yard touchdown to put the Frogs up 14-10 with 11 minutes remaining in regulation. The touchdown capped an 80-yard drive, TCU’s longest of the game. It did not take long for the Red Raiders to regain the lead. Just four minutes removed from Turpin’s touchdown, Duffey put the team on his back and rushed for a 38-yard score to put the Red Raiders up 17-14. Duffey’s touchdown was the final score of the ballgame. Up next, the Horned Frogs will welcome a rested, one-loss Oklahoma Sooners squad to Amon G. Carter Stadium.